I did something recently that I dearly wish I did ten years ago. I finally entered the world of dry suit diving and for the first time in my life, didn’t feel cold underwater in Adelaide winter. I didn’t feel cold on the boat. I didn’t feel cold in the water. I didn’t feel cold on my safety stop, and I didn’t even feel cold on the way back to shore as the wind whistled past our ears. 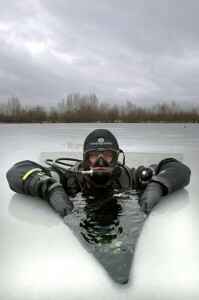 Dry Suit Diving is definitely what I’ll be doing this winter! Having a whale of a time diving on The Nauti Nomad in a Dry Suit. Let me walk you through how it all happened. 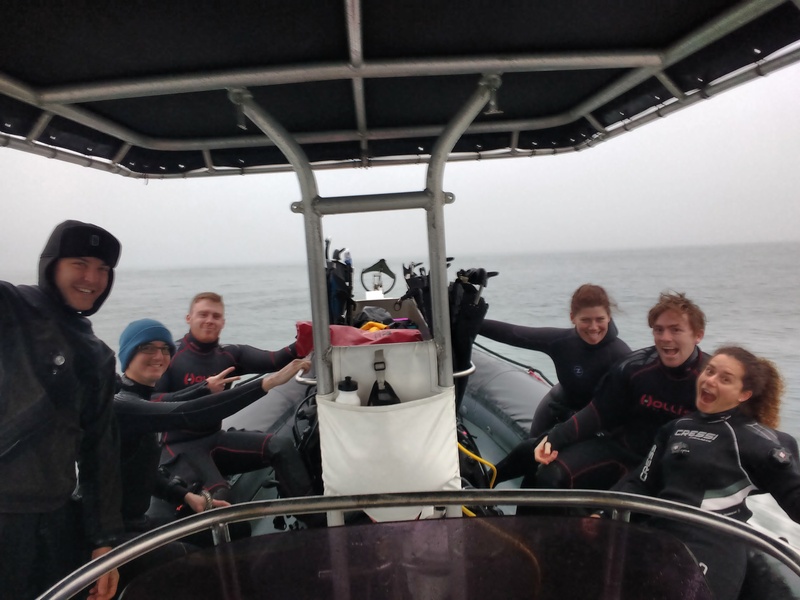 Back in February, we took on a new staff member who happens to be a dry suit and technical dive instructor. I didn’t really want to let a male into the ranks at The Dive Shack, as we were proud of the fact we were the only all female run diving store in Adelaide. JD said he could sell Ice to Eskimos though, and looking at his very impressive credentials including 15 years diving and 7 years experience in the military, we decided it could be what our tiny family owned business needed. Fast forward three months and JD has me trying on a dry suit for the first time in my life. It feels easier than I expected. I was always a diver who thought diving was about getting wet. Dry suit diving looked and sounded complicated, and I honestly didn’t really know where to start. However I also dreaded the cold mornings in winter, driving out to the dive site in the fog. Waiting patiently for a student to clear their mask all the while pretending I wasn’t cold. It was definitely what made me want to escape winter and dream of tropical locations. It was rare that I’d dive to the end of a tank without feeling cold from about March through to September. Even though I get a good 90 mins out of a standard tank, it was often very unpleasant for the last hour. And it was a real shame – some of Adelaide’s best diving happens in winter. We often get long periods with very little wind, improving the visibility and making the days out on the water beautiful despite the cold. So how did I suddenly change to loving winter diving? It’s 7am on a frosty winter morning. I wake up and put on my new thermal dry suit undergarments. I’m instantly warm and cozy. I add ugg boots, grab a flask of hot tea and head around the corner to my local jetty. The first advantage of a dry suit is immediately obvious when I don’t have to get undressed. I leave my cozy warm thermals on, and put the dry suit over the top. I put my gear on, and my instructor puts his suit straight over his jeans and jumper, much to the curiosity of the locals on their morning dog walks. We head into the water, and I immediately notice how weird it feels not getting wet. My legs feel slightly pressed by the water, but not unpleasantly. JD has me descend into shallow water and I start getting used to the change in buoyancy the dry suit diving creates. I turn somersaults, invert myself, cruise around upside down and practice adding and removing air. It’s nowhere near as challenging or difficult than I thought it would be, though it certainly feels very different. But the best thing is – I actually feel warm! After a few more skills and some more fun time to get used to everything, we get out and take our gear off. Now here comes the best part – I’m dry! JD takes his suit off, and is already in jeans and t-shirt ready to go about the rest of his day. I’m grinning from ear to ear. We head over to the Nauti Nomad – The Dive Shack’s semi-rigid inflatable hull boat and gear up for a couple of ocean dives. I’m slightly nervous again but excited. On board, it’s great to feel warm and dry and again not have to change into a wetsuit. I zip my drysuit up, and I’m instantly toasty as we cruise out to the dive site. My first dry suit dive feels a bit weird, but I soon get used to adding little bits of air to my suit to keep feeling comfortable as the air is compressed by the water pressure. I soon get into a rhythm with it, and add a little to my dry suit and my BCD every few metres through the descent. The dive feels a little weird, my buoyancy is slightly off, but I gain confidence as the dive progresses. We complete a 50 minute dive, and I don’t even feel a tiny bit cold. I feel warm!! I really can’t explain how incredible it feels to be warm in 15 degree water. We hop back on board, and I’m amused at the divers on the boat in their wetsuits who are all shivering. I know how they feel. I also know I’m now in the “dry suit club” and I’m never leaving. This is awesome. This is definitely not me in a dry suit. This is Mark Bruce. But you can do this in a dry suit! I enjoy my surface interval on the boat, and then we are back in for a second dive. This dive feels really good, I’ve got used to the feel of the suit, and everything starts to feel normal. We explore the shipwreck together, and have a blast swimming around looking at fish. It feels strange to be warm and dry – kind of cozy. Back on the boat after our second dive, is when the advantage really hits. Everyone else is freezing and can’t wait to get back to their cars to dry off and get warm. There are a few of us dry suit diving, and we are all comfortable, making jokes and enjoying being dry and warm. The dry suit completely stops the wind on the boat ride back, and after putting my gear in the car, I throw some jeans over the top of my thermal undergarments, and head to the pub to debrief and chat with the other divers about the day. I’m really looking forward to my next winter dive! And so it was with a little hesitation, a little excitement and plenty of hope that I finally, after ten years diving, and with JD’s encouragement, put on a dry suit and, with great relief, changed my diving habits forever. Master Scuba Diver Trainer and Master Freediving Instructor. Manager at The Dive Shack. Come in and see us or give us a call on (08) 8371 5822 if you want to get fitted for a dry suit and start making the most of winter diving too!